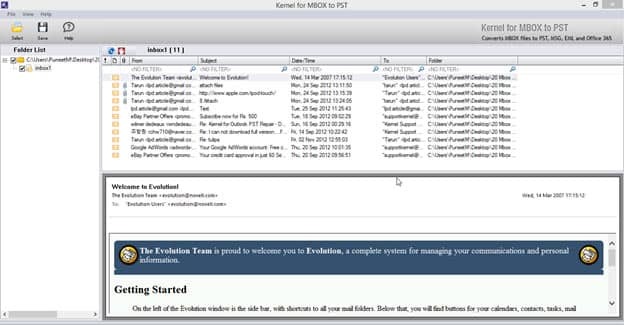 Evolution is the free software application that provides emailing platform, Calendar, to-do list and much more. Designed and developed on the basis of MS Outlook functionality, Evolution’s user interface is very similar to it. This not only provides the known environment to the user but also makes the utility perfect to use. Being a freeware, Evolution is the most preferred freeware to remain connected to the users. With the availability of sophisticated features, the preference for Evolution has been redirected to Outlook platform. 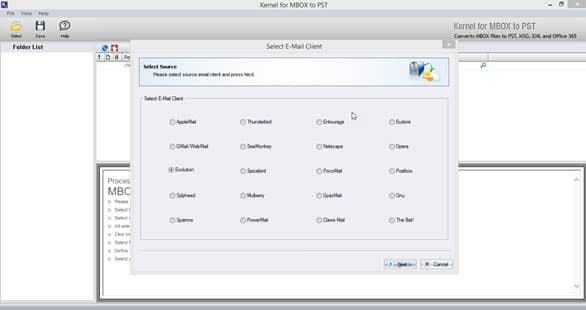 In such case, migration of email items from Evolution to Outlook platform is suggested and the best method to achieve or perform such email migration is by using external utility like Kernel for MBOX to PST. 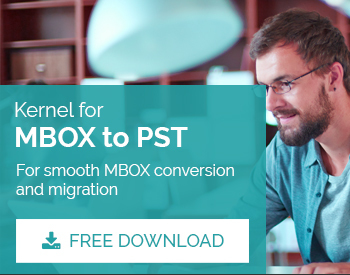 Open Kernel for MBOX to PST. From the 20 MBOX clients, select ‘Evolution’. In the next window add Evolution MBOX files by clicking ‘Add Files’ to be converted to Outlook PST file format. 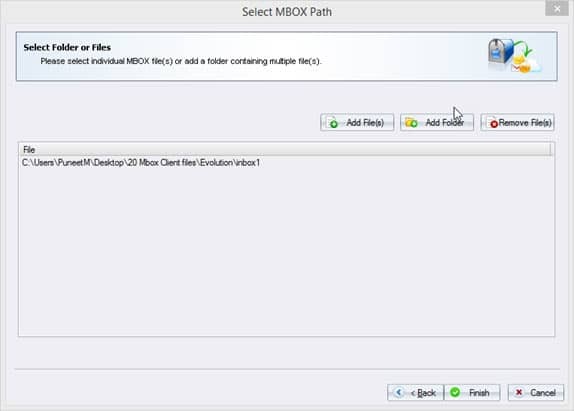 In case to delete any selected MBOX files use ‘Remove Files’. Click ‘Finish’ button to proceed. 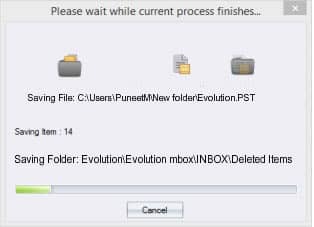 The next window provides descriptive of the Evolution MBOX files to be converted into Outlook PST. Click ‘Save’ button to save the file. A new window with different conversion options will appear. 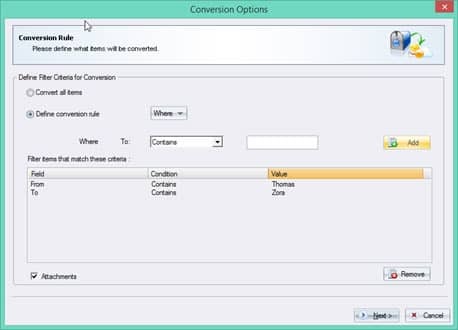 It includes two conversion options, namely: ‘Convert all items’ and ‘Define Conversion Rule’. To convert all items, click ‘Convert all items’ followed by ‘Next’ button. 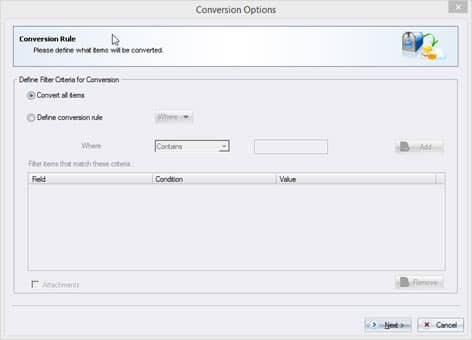 To define new conversion rule, click ‘Define Conversion Rule’ followed by defining other norms. Select ‘From’ from the drop down menu and specify a value contained within “From” field. Select ‘Subject’ only if subject line of the concerned mail is known. Specify the date range in the ‘From’ and ‘To’ in ‘Date‘ field. Once done, click ‘Next’ to proceed to a Window with different saving options. It includes ‘Save in PST’, ‘Save in MSG’, ‘Save in EML’ and ‘Save in Office 365’. 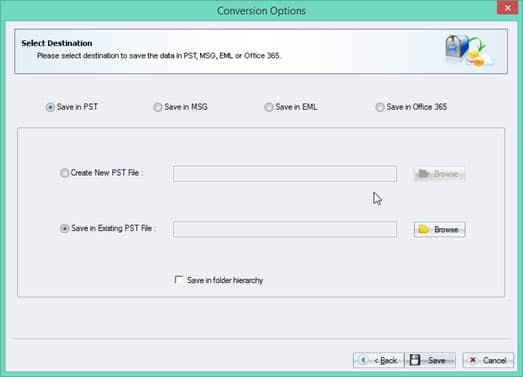 Click ‘Save in PST’ to dive PST saving process. Select ‘Create New PST File’ option to create new PST file and provide the destination path using ‘Browse’ option radio button. 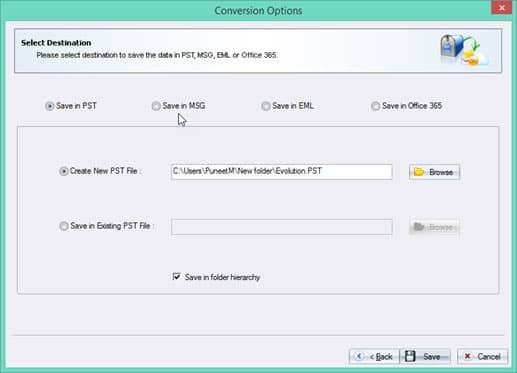 If PST file pre-exists, then provide the destination path of it using ‘Browse’ button after selecting ‘Save in Existing PST File’.